Two art festivals supported by The Arts Council are currently underway. 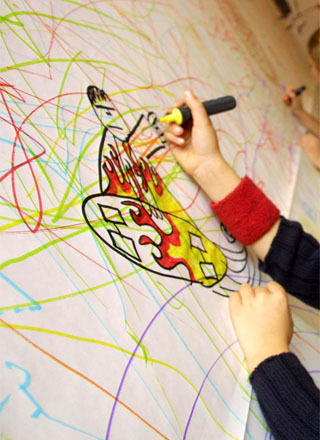 The Campaign for Drawing is running The 2013 Big Draw from 1 October to 3 November alongside The Family Arts Festival, which is taking place between 18 October and 3 November. 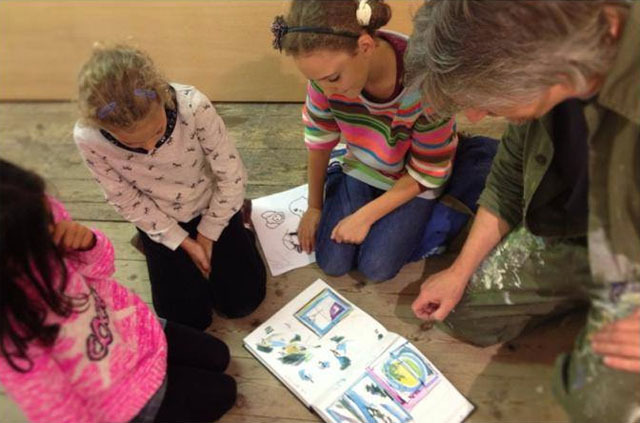 The aim of The Big Draw is “to get everyone drawing!”; drawing helps people think, feel, communicate and understand the world. It can be both inspiring and relaxing. Several events have already taken place, including Ballantyne & Cole’s “Draw your own Cornish Cream Tea” at their studios in Truro (pictured above). The results were beautiful (see left) – and everyone enjoyed eating the props afterwards. Join students from Falmouth University for an Aquatic Art Supersized Event at the National Maritime Museum Cornwall. Using drawing, animation, printmaking and sculpture, help create a sketch book inspired by the poem The Rime of the Ancient Mariner. 12 noon – 3.30pm, Sat 26 & Sun 27 October. 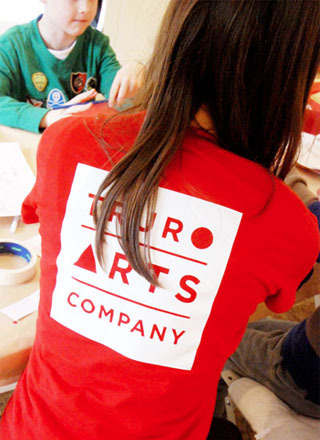 Children are invited to a Futuristic Cityscape Workshop at Truro Arts company. Using printmaking techniques they will help create a massive seven metre long cityscape of what Truro might look like in the future, with crazy buildings, space ships, flying machines, rocket cars and alien pedestrians. The boards will then be on display outside Truro Arts Company for all to see. 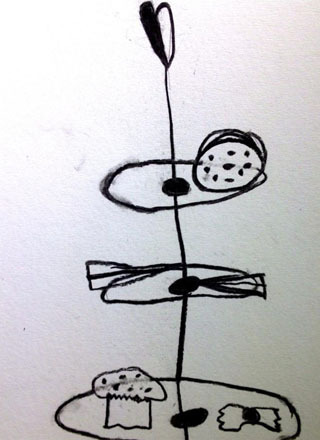 Draw Tomorrow, The Shape of Things to Come….. at the Royal Cornwall Museum, Truro. 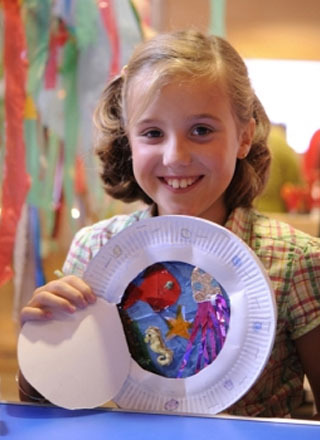 A free, family event, decorating the museum with your futuristic designs. 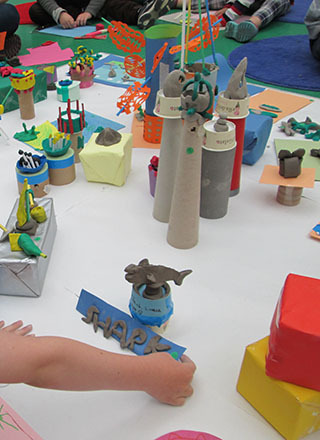 Visit Art Base at Tate St Ives to explore, play, create sea monsters and investigate art and ideas from their current exhibition: Aquatopia: the imaginary of the Ocean Deep. Ashley Hanson is inviting children and adults to help him with his New York Trilogy Exhibition at The Castle in Bude. Come and create your own skyscraper (the bigger the better!) and stick it on the drawing, a huge panoramic city drawing in the Blanchminster Room. 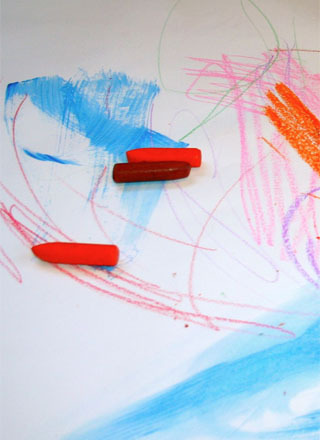 All materials will be provided and you can draw as many buildings as you like. Photos courtesy of Ballantyne and Cole, National Maritime Museum Cornwall, Truro Arts Company and Tate St Ives. Thank you.